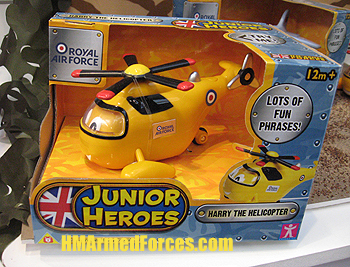 Junior Heroes toys have been developed by Character Options in conjunction with the Royal Navy and the RAF. Whereas the existing HMAF figures and toys are much-loved by a slightly older audience, Junior Heroes will definitely appeal to pre-school children. 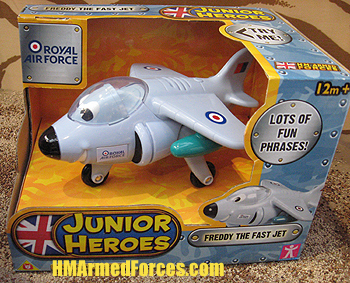 There are four Junior Hero vehicles to collect; Larry the Landing Craft, Sammy the Submarine, Harry the Helicopter and Freddy the Fast Jet. The HMAF Junior Heroes toys have a rounded and animated appearance, are push-along and feature sound effects and voice commands. “Bow doors up please!” says Larry the Landing Craft. “Dive, dive, dive!” exclaims Sammy the Submarine. 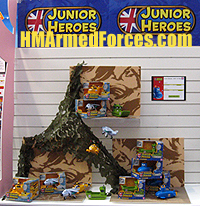 HM Armed Forces Junior Heroes are available from 2010.